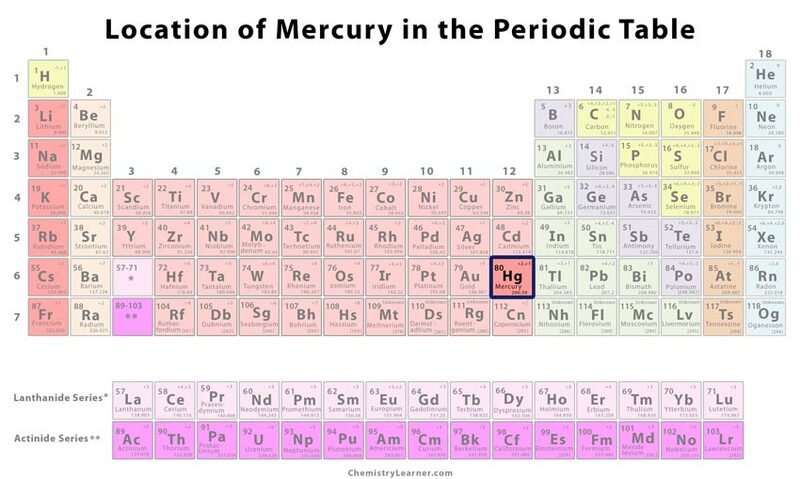 Mercury (pronunciation: MER-kyoo-ree) is a heavy, silvery element belonging to the family of transition metals in the periodic table and represented by the chemical symbol Hg [1, 2, 3]. It is the only metal that exists in its liquid form at standard temperature and pressure conditions . 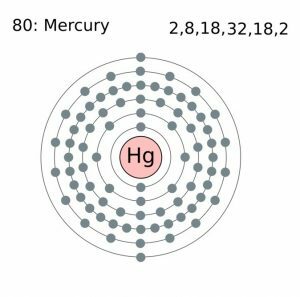 Mercury is characterized by seven stable isotopes out of which 202Hg occurs most with a natural abundance of 29.86% . 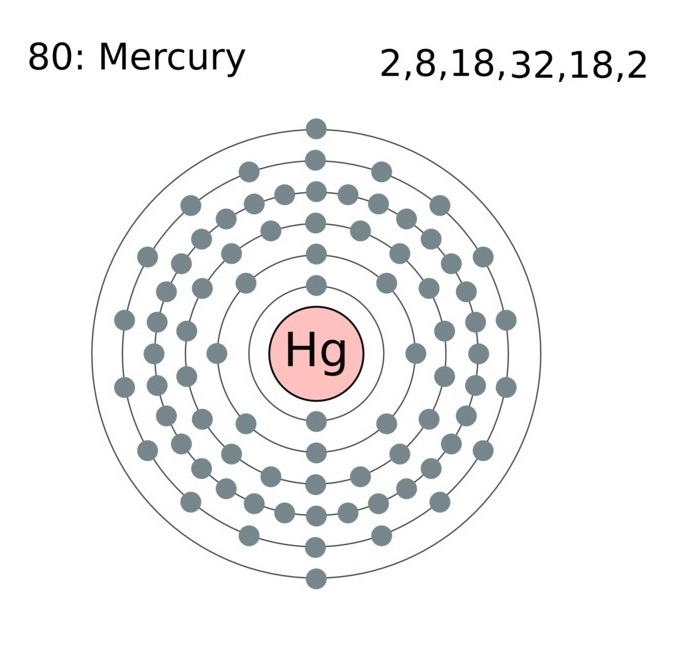 There are about 34 radioactive isotopes of mercury with 194Hg and 203Hg being the longest-lived having half-life periods of 444 years and 46.612 days respectively . It is mostly found combined with other elements in nature but can occur as tiny droplets in cinnabar, which are red mineral ores of mercury (II) sulfide . The element is extracted by heating the mineral ore in the presence of air and then condensing the vapor . China, Kyrgyzstan, and Chile are the top mercury-producing countries while Mexico, China, and Kyrgyzstan have the highest mercury reserves in the world . Who discovered it: The element was probably discovered thousands of years ago and used by the ancient people in India, China, and Egypt, as it has been found in trace amounts in the 3500-year-old Egyptian tombs . The early humans used cinnabar (mercury sulfide) to decorate the caves in France and Spain with paintings during the Paleolithic era about 30,000 years ago . The metal was widely used by the ancient people as a liquid to extract gold from the sediment of rivers . As a liquid, the mercury would dissolve gold that could be recovered through distillation of mercury . The Spanish conquerors in the Americas obtained cinnabar from the mercury deposits at Huancavelica in Peru to extract gold . It was also used by the miners to obtain gold from the New Almaden Mines during the California Gold Rush in 1848 . 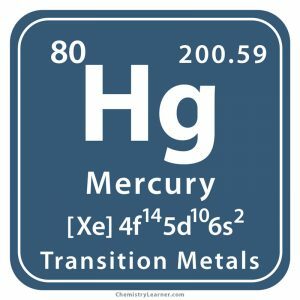 Mercury was also used by several chemists, including Carl Wilhelm Scheele, Joseph Priestley, and Humphry Davy to discover other elements . 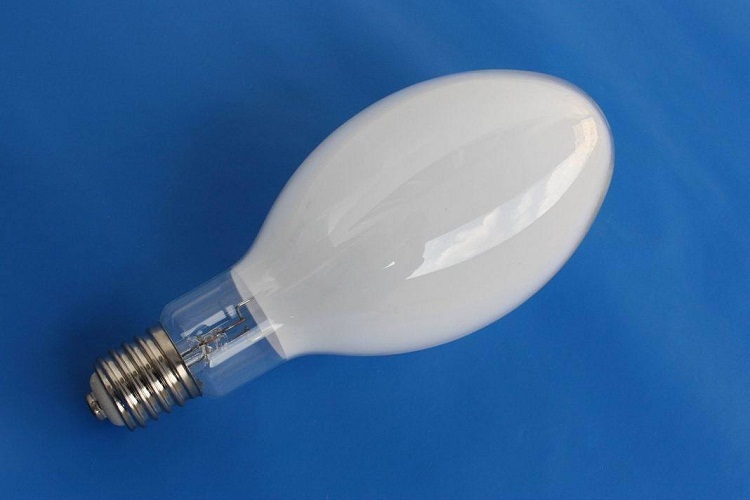 It is used in electrical switches and rectifiers because of its high electrical conductivity, and as catalysts in the chemical industry . It easily forms alloys (or amalgams) with other metals like silver, tin, zinc, and gold [1, 2]. The amalgams were previously used for extracting gold from the ores and also for producing dental fillings [1, 2]. Mercuric sulfide, commonly called vermillion, is a bright-red pigment used for painting . However, it is now cautiously used due to its high toxicity . 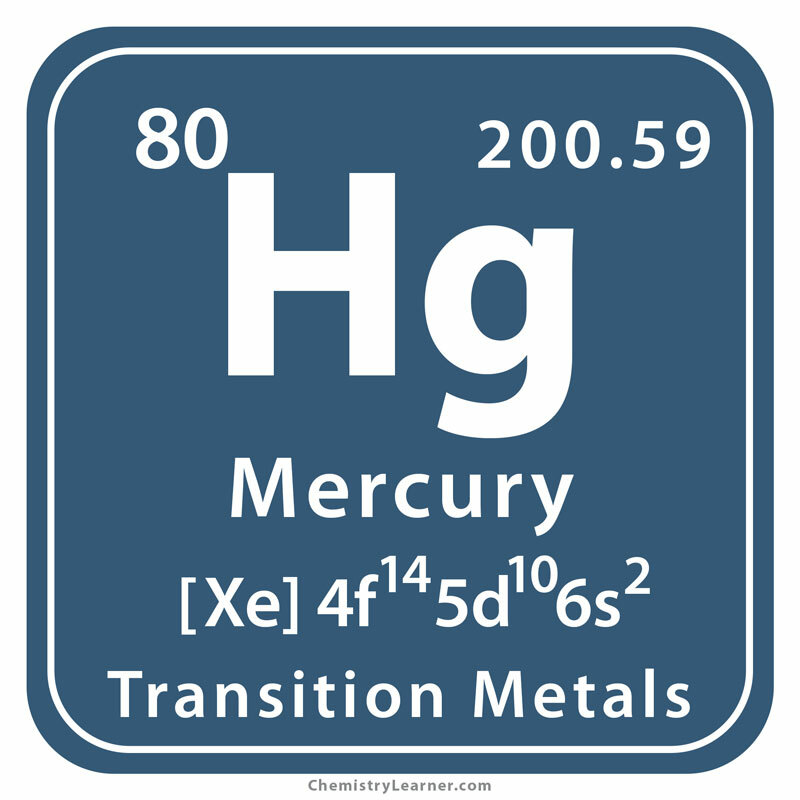 Mercury was commonly used in thermometers, barometers, batteries, fluorescent lights, and felt production [1, 7]. However, these have been discontinued . Mercury compounds like HgCl2 (mercuric chloride) and Hg2Cl2 (mercurous chloride) were used for disinfecting wounds and kill bacteria as an antiseptic respectively . Mercury and its compounds are poisonous [1, 13]. Exposure through skin contact, inhalation, or ingestion usually affects the kidneys, stomach, intestines, and the nervous system . It exists in every living organism in little amounts and enters the human body through the food we eat, with the daily intake being less than 0.01 mg . However, consuming large amounts of mercury, especially methylmercury, can cause severe illness and death . Mercury is not known to play any biological roles . Alchemists thought that combining mercury with other metals would help in turning it into gold . 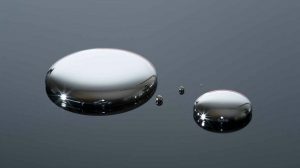 Mercury weighs 13-14 times more than the same volume of water . 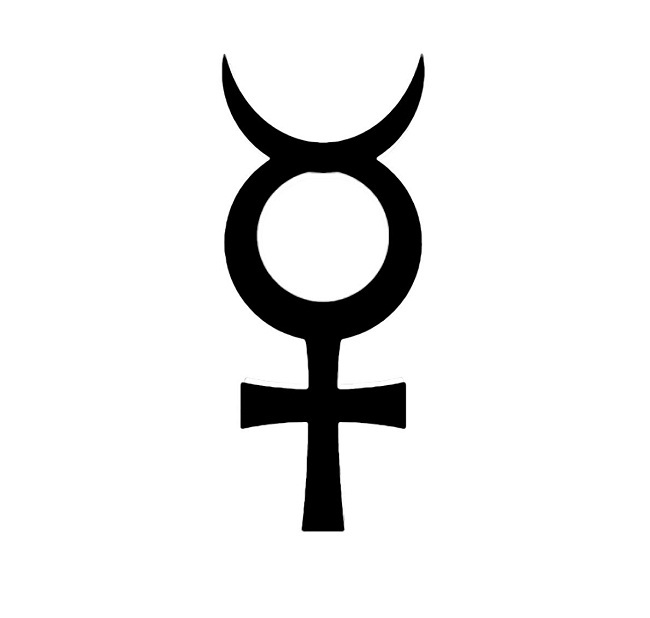 The graphical representation of mercury is an alchemical symbol, also indicating the planet Mercury . The price of pure mercury is $0.48 per gram, and in bulk, it costs $0.0174 per gram .